Website Bandwidth Explained: What Is It and How Much Do I Need? | Host.ie - Linux Hosting packages for all your Irish web hosting needs. Website Bandwidth Explained: What Is It and How Much Do I Need? Have you ever been sitting in a coffee shop early in the morning, just riding out the fantastic internet connection? Slowly, as the day creeps on, you find that your pages begin to load more slowly, you’re less productive, and you wish you had the connection you did earlier in the day. The connection is slowing because more people are in the shop. Those people are using the wifi with you, taking up a piece of the limited space available. That space, or capacity to accommodate users, is called bandwidth. Website bandwidth is a huge consideration when your site starts to pick up steam and generates traffic. We’ll cover just what website bandwidth is and why it’s important for you. 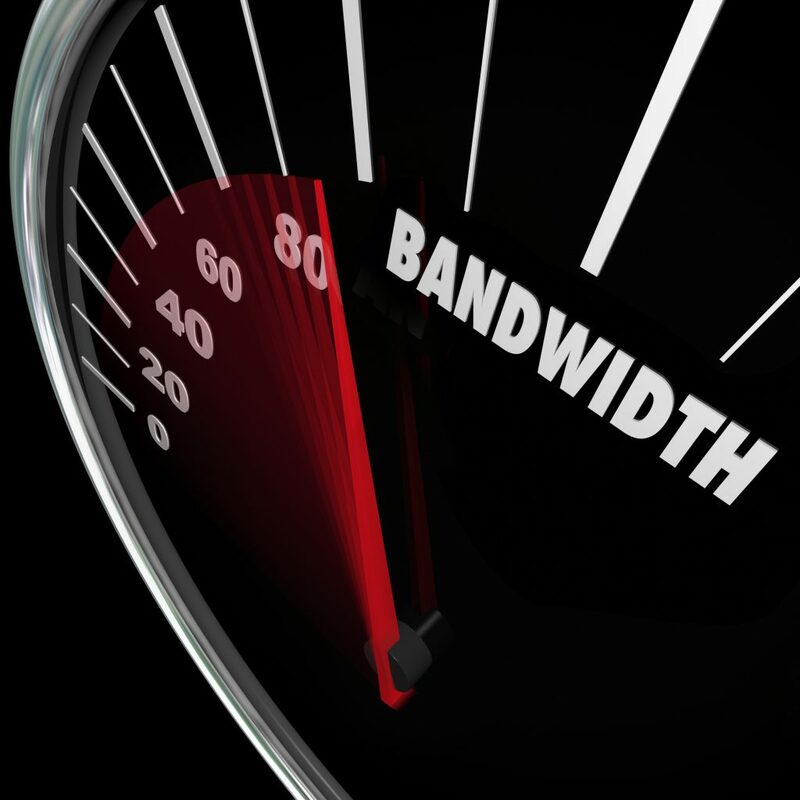 Bandwidth refers to the rate at which information can move through a specific server or website. The nuts and bolts of how it works aren’t as relevant as understanding the concept and ways that you should approach it. We’ll use a couple of metaphors to describe bandwidth and why it matters. The general bandwidth of, say, the place you are sitting right now could be imagined like a highway. Imagine that you’re having trouble sleeping, you live out of the city, but you’re close enough to hop in your car and go see a movie downtown. You check the movie times and you notice that you’ve got 25 minutes before the next showing and it takes you 30 minutes to get to the theatre if you take the highway. The highway is empty, and you push the speed limit a little bit, free to cruise down the highway exactly as fast as you want to. There’s no one on the road, so you can move extremely fast. Liken that situation to sitting at a cafe early in the morning. You’re the only one using the bandwidth so you can soar through the internet at breakneck speeds. As rush hour comes on and the cars start building up on the road, you find that you’re not able to move as quickly and you start wishing that your city had planned its highway system a little better. So, that’s how you should think of the general bandwidth in the space that you’re in. Now let’s imagine the bandwidth of your website. In plain terms, website bandwidth is your website’s capacity to accommodate traffic. The more gigabytes you pay for, the faster your system will operate and the more people it will be able to support. Imagine your website’s bandwidth as a little cafe on the side of the highway. You run this shop, and your customers have a reasonable expectation that they’ll be able to get their food in a short amount of time. Your cafe only has so many tables and can seat so many people. You have 300 customers a day but you only have 200 tables. Everyone trickles in consistently throughout the day so you never reach capacity. But what if that changed? What if your website (your cafe) gained popularity and was overrun with customers who were all frustrated at how slow their service was? Think about where your site is currently at. In terms of traffic, do you know what kind of volume your site experiences every day, month, or year? Small businesses don’t need to worry too much about the size of their bandwidth. Most hosting websites will have ample bandwidth for you at a nominal cost. If you have a site that does roughly 5,000 visitors a month or more, you should worry about upping your bandwidth. Anything below that and you should be doing just fine. That can change up a little bit, depending on the nature of your site and if you offer a lot of streaming, downloading, or media. A heavy dose of those things can stuff up your bandwidth like oversized trucks rumbling slowly down the highway. That being said, you don’t want to grow unexpectedly and fail to accommodate your users. If you’re approaching that 5,000 visitor mark, or feel that your site is slowing down a little, it might be a good idea to boost your bandwidth preemptively. It’s difficult to pick your bandwidth plan if you don’t have a good grasp on how much traffic you’re going to have. On the one hand, you don’t want to pay for more than you need. On the other, if you aren’t prepared, you won’t be able to give your visitors the best service possible. It’s hard to say just how much traffic you’ll be getting. Take a look around for other sites that are similar and look into their traffic. If you’ve started sites before, you should have a better idea, but it’s a good idea to look to the competition if you don’t have much experience. Beyond that, it’s smart to estimate projected traffic and pick a plan to start out with. Run with that plan for the first few months while you document how your traffic is coming in. Run the numbers and adjust the plan as needed when that’s the case. If you already have a fully functioning site, the process of accurately planning for bandwidth is pretty easy. The first thing to do is take an average of the size of each page on your site. You’ll do this in kilobytes. You’re probably wondering how in the world you’re supposed to do that. There are a number of network monitoring tools that can give you those numbers. They also provide you with tools to examine your site and keep on eye on bandwidth usage. You’ll take that average and multiply it by the average number of visitors you have each month. You’ll then multiply that number by the average amount of pages your visitors look at. You will need to do this across every domain that you run. This is only relevant if you’re running more than one site. If all of those numbers are freaking you out, run through a bandwidth calculator for some assistance. If you need to find an available domain name for a new site, we can help you find the perfect one. There are a few things that could modestly change your required bandwidth. As we mentioned, most average sites don’t require too much bandwidth. Those that require more are typically sites that do a lot of file hosting and streaming. That being said, alterations or developments can change your requirements. First, if you change the layout of your site, the size of the pages are liable to grow and use up more bandwidth. If you plan to grow as a site, which you probably do, you will also need to keep an eye on traffic growth. Growth, of course, will constrict your bandwidth if you choose not to upgrade. Things like additional applications and improvements will all have an effect. Traffic is an unruly thing by itself, too. Certain events, commercials or trends could send you a spike in traffic that you had no part in. This is a great thing, but unexpected boosts in web traffic can be a challenge as they’re happening. Finally, you will probably want to expand the actual size of your site. More web pages, more blog posts, and maybe even affiliate sites that you run within your account will all contribute to increased traffic. Those changes can be extremely difficult to manage. Luckily, we have options available for quality domain management at reasonable prices. Ultimately, because traffic can be so unpredictable, you should lean on the safe side and purchase a little more than you need. In fact, you want to purchase significantly more than you expect to need on an average day. You probably won’t ever need to use all of the bandwidth that you purchase. The problem is that there are overage charges for times when you go over your bandwidth limit. Not only does your site slow down, but you must also pay fees on the extra usage. Fortunately, the cost of purchasing a little extra bandwidth is nominal in comparison to the fees you would get if you had an unexpected spike in traffic. It’s the smart move. Not to mention, when your site inevitably expands, you’ll have the excess bandwidth needed to hold those changes. You’re going to be prepared to handle the chance that your site doubles, or even triples its site volume in the span of a month or two. Once you identify a website bandwidth that suits you, you’ll need to find web hosting that suits your needs. There are options for those who need multiple domains, GB of web traffic options, subdomains, and levels of website space. If you’re looking for an excellent web provider, we have been in Ireland’s top tier of providers for nearly 20 years. For more information on getting started, contact us and we’d be happy to help you out.